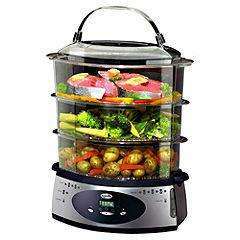 Healthy, delicious cooking is so easy with the Breville VTP068 Digital Herb Infusion Steamer. It has three tiers through which the steam rises to cook the food. These multiple tiers offer a chance to cook different foods at the same time, in one self-contained appliance, minimising post-meal cleaning. Each has a 9L capacity - making it ideal for families and large households. You can also remove the inner trays to accommodate larger foods. There's no need to monitor it throughout the steaming process thanks to the 24 hour digital timer, allowing you to pre-set the steaming sessions. Further design features include an external water indicator for easy use, the external water-filling spout so you can add water without having to dismantle the unit and the Keep Warm function, a low setting which maintains the heat of the food without over-cooking it. And once the meal is over, the tiers are fully collapsible for easy storage. This healthy approach can be applied to a number of varied foods, from fish to vegetables, chicken to potatoes and rice to fruit, providing a wealth of healthy and nutritious meal ideas. I dont use enough herbs to use something like this. Reviews on Amazon are not great but good price. Good if u don't have a kitchen. Still on as just bought one.